A Polish Roman Catholic priest on Thursday rejected criticism leveled against him and his conservative media empire after tapes surfaced in which he allegedly made anti-Semitic comments and called the Polish president's wife a "witch." The Rev. Tadeusz Rydzyk, a powerful priest who runs a conservative-nationalist media empire that includes the ultra-Catholic station Radio Maryja and the national Nasz Dziennik newspaper, was allegedly caught on tape suggesting that Jews are greedy and Polish President Lech Kaczynski is subservient to Jewish lobbies. The Polish weekly "Wprost" published excerpts from a lecture Rydzyk allegedly delivered this spring at a journalism school he established in the central Polish city of Torun. In the lecture, Rydzyk allegedly criticizes Kaczynski for bowing to pressure to compensate people - many of them Jews - for property nationalized by the postwar communist government. "You know that it's about Poland giving US$65 billion dollars" to the Jews, Rydzyk reportedly said. "They will come to you and say: give me your coat. Take off your pants. Give me your shoes." In an interview in Nasz Dziennik published Thursday, Rydzyk suggested the tapes were doctored to damage Radio Maryja during celebrations marking the 15th anniversary of the station's foundation at Jasna Gora, site of a Catholic shrine. "Once they learned that the prime minister would be at Jasna Gora (for the celebrations), they prepared, they assembled some fictitious story," he said. "Besides, it's very easy to put together something like that. With the help of a computer one person can do it quickly." He says he "never spoke against the first lady," but then appears to suggest he did indeed make the comments, only that "Wprost" twisted their meaning. "If journalists distorted my words and the first lady has suffered or is suffering because of that, I'm very sorry about it," he said. Rydzyk reportedly criticized the first lady for her support of abortion rights and was quoted as saying: "You witch! ... If you want to kill people, do it to yourself first." 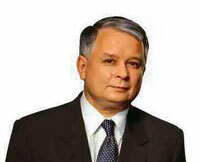 Both President Lech Kaczynski and Prime Minister Jaroslaw Kaczynski, the president's twin brother, have sought to downplay the comments, saying they need to be absolute certainty the tapes are authentic before commenting on them. However, international groups have slammed Rydzyk and called on Poland's leaders and the church to condemn the priest. "Anti-Semitic content broadcast on Radio Maryja continues to include ugly stereotyping, conspiracy theories, claims that Jews were responsible for communist-era repression and accusations that Jews are using the Holocaust to leverage compensation payments from Poland," Anti-Defamation League leaders Glen S. Lewy and Abraham H. Foxman said in a joint statement. Meanwhile, another leading Jewish human rights group called Rydzyk's reported remarks "outrageous," and even compared the priest to Hitler's chief of propaganda. "This is outrageous - a Josef Goebbels in a collar," said Rabbi Marvin Hier, the founder and dean of the Los Angeles-based Simon Wiesenthal Center. "Once again, anti-Semitism has been injected into the mix of making the Jews, yet again, the scapegoats of another political crisis." "Father Tadeusz Rydzyk is not merely an individual - as a priest he speaks for the Catholic church and it is the church that must discipline him."